With their excellent waste-pickup schedules, professionally trained staff and high-quality equipment, thousands of residents trust El Paso ECO Disposal when it comes to maintaining a clean community. Economical, efficient, professional along with reliable private trash collection services form a vital aspect of improving the lives of these communities. With pickup schedules that are flexible and various container sizes, the company also customize their Greater El Paso County trash services in accommodating the unique disposal and collection requirements of each household. El Paso ECO Disposal offers roll-off containers for residential purposes that provide a safe and convenient way to contain construction and demolition items in large amounts. These services are ideal for residents that have a renovation or demolition project planned for their homes. For environmental, legal as well as safety reasons, there are specific waste materials which are not permitted in the recycling and front-loading trash containers. For the businesses that generate high volumes of solid compatible waste such as grocery stores or hotels, the Eco El Paso Disposal compactor units are able to save space, decrease the frequency of pickup and cut back on the collection costs associated with commercial waste. Dependent on the type of materials, these compactors are able to reduce the waste volume by as much as 80% with virtually no handling. This means that one unit is able to contain 400-cubic yards before the process of compaction, which equates to around 200 trips of a standard pickup truck removals. 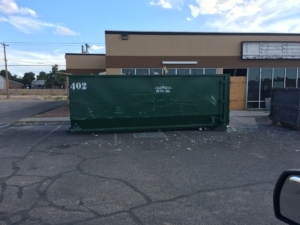 El Paso ECO Disposal offers various open-top roll-offs and removal containers for construction waste to match up to the requirements of any waste-removal need for all El Paso construction sites, public clean-ups or events, and large businesses. The roll-off services are suitable for both large demolition projects or small-home remodels. These services on offer from El Paso Disposal offers the most cost-efficient, safe, time-saving and convenient trash containment choice.